The Silahis ng Karunungan SPED Center of Padre Gomez Elementary School, Manila celebrated the 56th Special Education and Giftedness Week last November 21-27, 2012 through various activities that showcased the talents their students with disabilities, promoted the children's rights and educated their families. ASP Executive Director Ranil Sorongon was invited, through Ms. Beth Udquin and Jenette Rodriguez, officers of ASP UP-CAMP Manila chapter, to give a lecture on the United Nations Convention on the Rights of the Child (UN CRC). Even with the cramped and somewhat hot venue, the more than 120 participants composed of parents of students with disabilities, teachers, teacher-interns and students with different disabilities were attentive to the lecture. A student with autism was given an opportunity to read his right in front and a teacher-intern who is a sibling of a child with disability shared her “willingness wholeheartedly to take care of her sibling when their parents are gone”. They were both applauded by the audience. 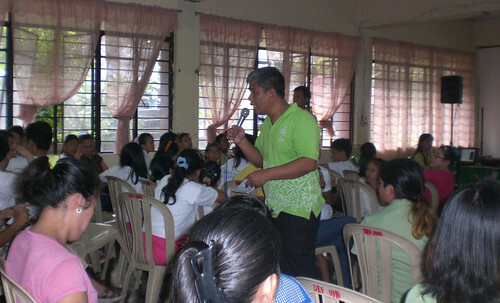 The attendees showed off what they learned in the very simple oral quiz conducted by Mr. Sorongon after the lecture. Even the deaf students eagerly participated with their teachers as their sign language interpreters. Mr. Sorongon also showed the video of the 1Pangako campaign, an advocacy project of ASP to end the negative use of the work “autistic” and to support the realization of the rights of persons with disabilities. He also took the opportunity to share ASP’s “Educating Children with Disabilities of their Rights Using the Digital Talking Books” project and showed a sample of the digital talking books to the audience. Special Education has been implemented in the country for more than a century. Yet according to the Department of Education, ninety-eight percent of school-age children with disabilities are not in school. Mr. Sorongon posed the question: Have there been concrete changes to realize the rights of Filipinos with disabilities? Thanks to institutions like the Padre Gomez Elementary School who answer the need for education, the Philippines is rising to meet our sector's aspirations.